Terntank has ordered two new LNG-driven 15 000 DWT tankers from Chinese company AVIC Dingheng Shipbuilding Co., Ltd with delivery in February and May 2016. The order also includes an option for two more vessels. 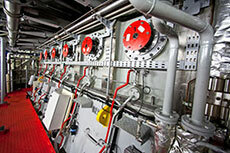 Terntank is the first ship owner to order vessels within the project platform Zero Vision Tool (ZVT). With a newly developed dual fuel main engine from Wärtsilä, and an advanced hull design from Rolls Royce, Terntanks new vessels will be able to meet all future regulations already in 2016. The tankers emission of particles will be reduced by more than 90%, NOx by 80% and CO2 by 35% and they will be built in accordance with IMO Tier III regulations. The company will be using a large propeller together with a large main engine that only needs 65% of the maximum effect to reach a service speed of 14.5 knots. With LNG having a 10 -15% better energy value compared to marine gasoil, and with an optimised underwater hull design, the vessels will have a fuel consumption of between 13.5 - 14.0 t/d compared to those of today, which have 22 t fuel consumption, said Jens P Buchhave, Managing Director of Terntank Rederi A/S. In order to cope with the higher building cost for these vessels, Terntank, together with other participants in the ZVT, is in discussion with ports and governmental institutions for a 90% reduction in port costs and fairway dues. 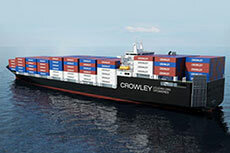 Crowley to develop environmentally friendly, LNG powered, combination container Roll-On/Roll-Off ships in contract with VT Halter Marine. 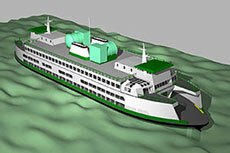 Washington State Ferries intends to convert six diesel fuelled ferries to use LNG. 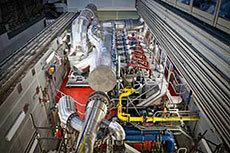 Wärtsilä has reported that the marine industry is already showing significant interest in the company’s new Wärtsilä dual fuel engine technology.